Kubernetes Monitoring extracts health and performance metrics from a Kubernetes cluster, as well as applications running in containers within the cluster. 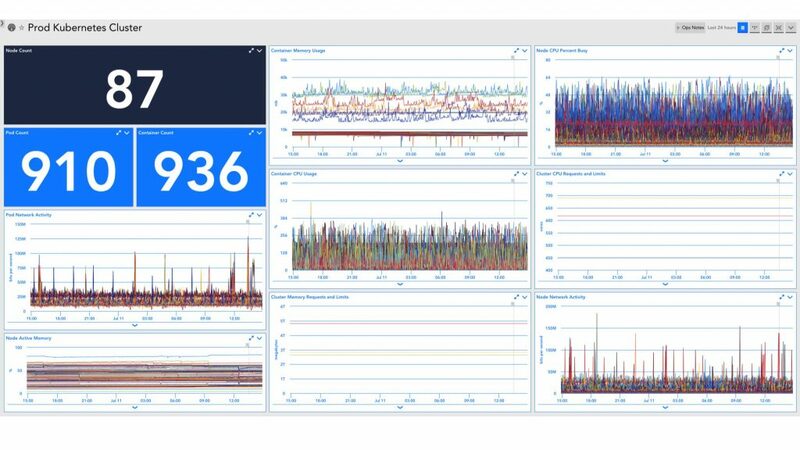 LM Service Insight lets customers group discrete application or infrastructure components to provide an overall health status of a service comprised of those components. LogicMonitor’s core platform collects metrics from on-premises infrastructure and cloud services. Those metrics include device information such as IP addresses, system type, configuration data, Windows and Linux event logs, and, for network devices, flow metadata. It also gathers performance information such as CPU utilization, disk space, and request latency. To gather this information, customers deploy collector software on a server on their premises. This collector maps the network and gathers topology information to understand how applications and devices are connected. The connector can, with user-provided credentials, log into individual devices to pull metrics. It can also pull aggregate data from existing tools such as server or network management systems. The collector encrypts and then ships this data to the company’s SaaS platform for aggregation, correlation, and analysis. Customers log in to a portal to view health and performance dashboards. Customers can set alerts, track and forecast resource usage, generate reports, and drill into specific devices to assist in troubleshooting. The new monitoring capability lets customers add Kubernetes to the infrastructure mix. As organizations begin to develop container-based applications in public clouds and in their own data centers, Kubernetes has become the container orchestration layer of choice. But you also need to instrument your Kubernetes environment. LogicMonitor deploys its own pod in each Kubernetes cluster you want to monitor, and pulls health metrics via APIs. Customers can track containers in the cluster, as well as what’s running in the container, such as application server or database. Logic Monitor’s Kubernetes Monitoring dashboard. Open-source options such as Prometheus are also available to keep tabs on your Kubernetes cluster. LogicMonitor argues that its product has additional value because it can monitor Kubernetes in relation to other components of the infrastructure stack that make up an application or service, giving administrators a more complete view. In other words, rather than watching a Kubernetes environment in a vacuum, LogicMonitor can aggregate cluster health with other relevant metrics such as server hardware or the network gear that connects a container application to the outside world. Which brings us to the second part of the announcement: LM Service Insight. As mentioned, this new capability lets customers logically group discrete elements into service-related bundles. For example, you could create a dashboard to monitor the overall health of a Web application. That health metric would be drawn from its underlying components, including physical servers, VMs, containers, switches, load balancers, databases, and so on. This service view aggregates the hundreds of metrics that comprise a single application. LM Service Insight can also serve as a starting point for troubleshooting. If a problem with an application arises or a service degrades, IT can drill down from the service level to find the associated component or components causing the problem. This, to me, is a compelling feature because it gathers an application or service’s dependencies into a single logical bucket, which may provide context that can help speed problem resolution. A service-level health metric can also be shared with higher-level IT leaders or executives who don’t care about server CPU and disk utilization, but do care whether a customer-facing application or the accounting system is in the green.